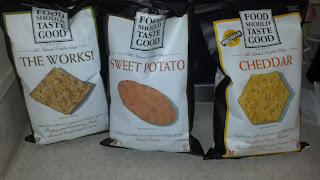 A Yummy Snack filled Giveaway!!! chips are gluten free, cholesterol free, and have zero grams trans fats. To read the full review you can head over HERE to do so. Disclaimer: The Momma And Boys has received the product as a gift to do a review and giveaway and all opinions are from The Momma And Boys! The Momma And Boys and My Kind Of Introduction is not responsible for shipping of the product. Who doesn't love yummy delicious cookies?! I haven't tried this brand of cookies yet but I'm looking forward to seeing how they taste! I'm glad The Momma And Boys enjoyed their batch! Read below to see what flavors they tried and now you can win your own Bart's cookies!! 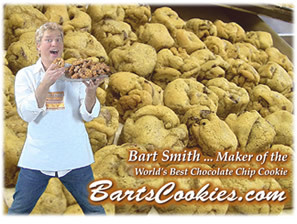 Bart's cookies has been making the World's best chocolate chip cookies for more then 20 years. Bart moved off to college in 1988 and no longer had his moms cooking. Since his mom was not around to cook for him he needed to start making his own food and decided to bake cookies! 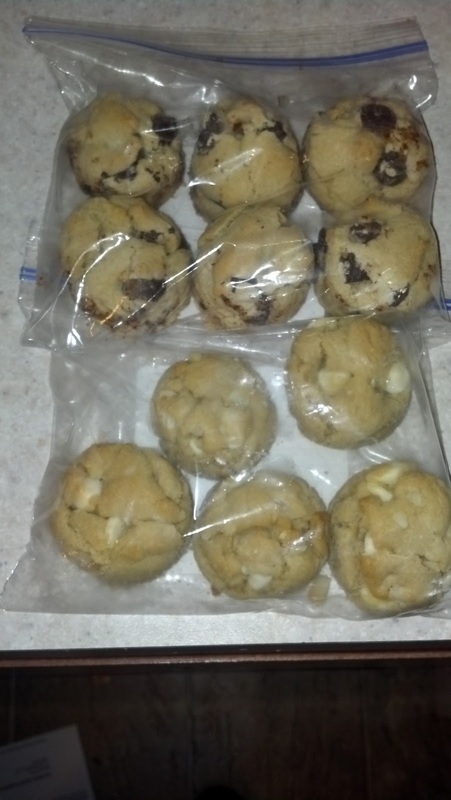 His cookies ended up being a big hit that he started selling them to people around the college he was at. My family and I decided to review the chocolate chip cookies and white chocolate chip and macadamia nut cookies. My husband is a huge macadamia nut cookie fan and when he tried this he was in love. He sat down and ate them all in one sitting and that is not like him at all! The chocolate chip cookies my children tried after dinner. They were in love as well and was asking when they can have more. I tried one as well and they were delicious. This had to be one of the best cookies we have tried. They are all so soft and just melts right in your mouth. You know Vera Bradley for their colorful bags, totes, luggage and more. 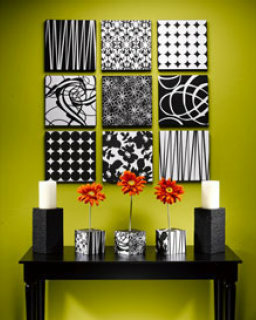 They are known around the world for their bright colors, fun patterns and amazing designs. You can now buy Birthing Announcements, Baby Shower Invitations and much more with Vera Bradley-inspired designs from Tiny Prints. Check out some of the awesome designs below. They have many Vera Bradley designs to choose from for baby shower invitations, birth announcements, thank you cards, stationery and address labels. 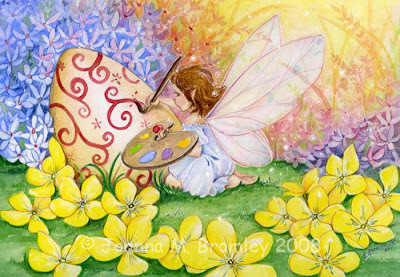 Plus, if you order by Tuesday, April 2, you can get up to 20% off birth announcements and baby shower invitations. Just use the code MAR20BA for birth announcements and MAR20INV for baby shower invites by 11:59pm PT on Tuesday to save up to 20%. Check out their entire collection and make your stationery as dazzling and beautiful as your bags. OK, so graduation may be a tough time for you parents, but that doesn't mean you can't celebrate in style. Why not announce the accomplishment and throw a party? Tiny Prints can help you do just that. They have more than 300 designs to choose from and you can customize the cards with pictures of your graduate, your own text, and more. Check out their designs and make sure to use the code MAR15GRAD at checkout to save 15%. You can also get free shipping on your entire order over $49 by using the code FS49. I'm sure everyone has already dyed Easter eggs this year and I've been a bit behind on all things Easter and I'm terribly sorry for that. Things have been a big hectic and my brain hasn't been working very well. 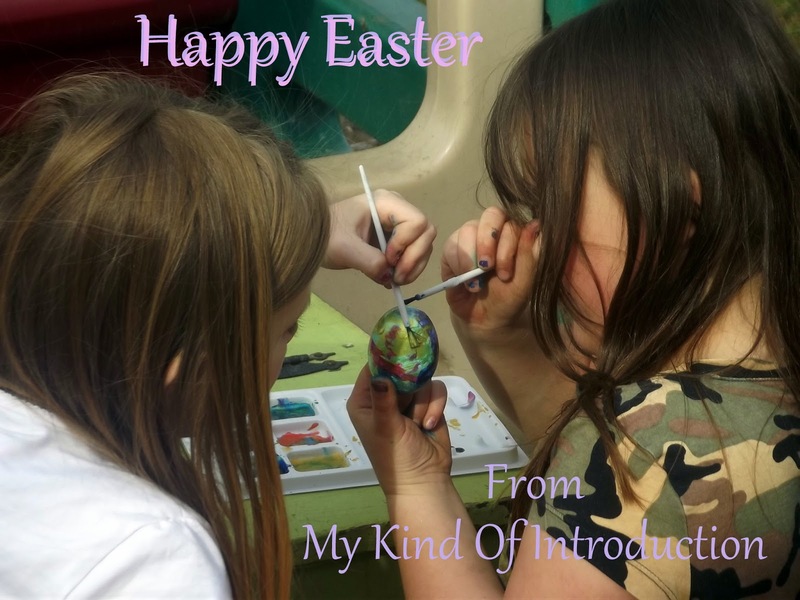 Yesterday my daughters and I dyed Easter Eggs and had a BLAST!!! We "dyed" our eggs 2 different ways. We painted them with a 40k Gold Egg painting kit that I bought at BiLo's last year and never used. We also Marbleized a couple of our eggs aswell. I marbleized the 1 egg I got to dye and the girls painted their marbleized "paint" and rolled it around a couple times. Would you believe that it's done with cheap shaving cream?? Now you have beautiful Marbleized Eggs! You may need to do it once more to get a darker color. I hope you have a WONDERFUL Easter!! Enjoy the fun time with your kids while they are little, time flies by so fast! Did you do any cool things with your Easter Eggs?? 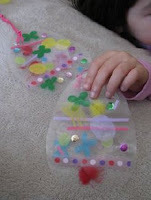 Looking for some easy crafts to pass by some time? Last-night I was on an ebook rampage and ended up downloading LOTS of Craft ebooks and found some really awesome crafts to do with my kids and by myself! One of my favorite books that I found is called Cheap and Easy Crafts. It's full of all kinds of crafts from things to do with the kids to making blankets and slippers!! Free eBook - "Cheap and Easy Crafts", featuring a collection of 60 low-cost craft projects, sorted into categories such as needle craft, home decor, crafts for kids and more. I downloaded this FREE eBook last night and I found all kinds of easy and very cute Easter crafts for me to do with my daughters! I can't wait to get started! 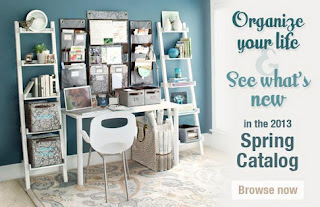 How to Decorate Easter Eggs, Easter Egg Hunt Projects, and more Easter Activities for Kids features 28 pages of our favorite homemade Easter projects + Crafty Kid Creations eNewsletter for FREE! Giveaway: 1 Year of Free Hosting & Domain Name for a Brand New Blog! We are having a giveaway for a Domain paid for the first year & 1 Year of Free Web Hosting for a Brand new blog! Once the winner is chosen, I'll email them and ask for the domain name of your choice (if the domain you chose is not available, another will be request of you). We will get everything set up as far as web hosting and domain, I'll even install wordpress for you. The domain will be purchased through Godaddy! The domain will be transferred over to your name after everything is set up. I was a bit of a party girl when I was young and I remember thinking that I knew it all. Noone could tell me what to do, It was my life I would live it the way I wanted... While I still feel that this is my life and I will live it the wau I want, I understand that I DO NOT know everything and I truly wish that I knew then what I know now... Things may of turned out differently. Or things could be just the same... I will never know! "What I Wish I Knew at 18" is an engaging, comprehensive, and conversational book written to help young adults achieve success in life. It provides practical, road-tested wisdom in essential life arenas as life perspective, character, relationships and communication, spiritual life, handling adversity, personal productivity, college academics, career selection and advancement, love and marriage, and managing finances. Through illustration, instruction, and reflective questions, the book reveals 109 success pointers. Unique in scope, universal in its message, and timely in its wisdom, "What I Wish I Knew at 18" is designed to serve as an invaluable life coach. Check out the full "What I Wish I Knew at 18 book review on Pea of Sweetness. For More: Visit the Author Dennis Trittin's Website and connect with him on Facebook and Twitter. Thank-you to our awesome Co-host At the Maple Table! About the Giveaway: This giveaway begins on 3/29 and ends on 4/12 at 11:00pm (times are CST) and is open to US residents ages 18+. Please refer to the full terms and conditions in the Giveaway Tools. The Prize: One lucky winner will receive the "What I Wish I knew at 18" book! Disclosure: I received no compensation for this publication. My opinions are my own and may be different than yours. My Kind Of Introduction is not responsible for prize fulfillment. When I found out that I was going to be this weeks Featured Blogger for the "I Love my Post" Blog Hop, I was extremely excited! 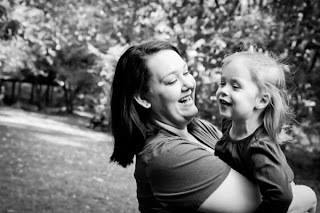 I'm a fairly new blogger and I can't believe how fast things have been going. I LOVE IT! Let me tell you alittle bit about how I started blogging and then I'll let you start hopping! The name of my blog was actually a mistake! 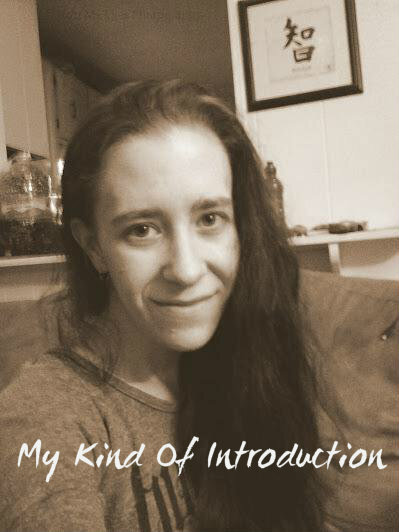 I was trying to make an introduction post for my blog and ended up naming my blog 'My Kind Of Introduction' instead of naming my post. After I realized what had happened, I decided that I liked the name and I stick with it. I've thought about changing it a few times but then I realize that I really like the way it sounds... I'm introducing people to new things everyday, the name fits! I created my blog a little over a year ago so I could post freebies that I would randomly find while searching through the web. I knew nothing about what I was doing and didn't really post that often. My blog was getting hits but I had other interests and like I said... I didn't really know what I was doing. Throughout 2012 I posted every now and then. For some reason, in January 2013, I decided that I wanted to be a blogger that posted everyday and rarely. Next thing I knew I was a full-time blogger with more information in my head that I could of dreamed about learning in such a short period of time! Being a blogger is wonderful! The beginning is always slow and I'm okay with that. My blog is growing each and everyday and I couldn't be happier! I have met some wonderful women that have helped me so much along the way and I owe a BIG Thanks to all of them! I also want to Thank all my fans and followers! I wouldn't be here doing what I love without you all!! My favorite things about having a blog is that I can help people out in ways that I was never able to do before! And I'm not just talking about with the Reviews and stuff like that. I'm talking about promoting Small Business and helping out other moms who are just trying to make it from one day to the next. I enjoy spreading the word about what my friends and other awesome people can do for others and if someone needs their help or products then everyone is happy! Helping others when I can is what puts a smile on my face, even if it is simply giving a mom a new craft idea to do with their kids or telling a mom about an awesome business that makes Bows for little girls. Every little bit helps and I understand that more than ever now. I believe 2013 is going to be an Awesome year for My Kind Of Introduction! NEVER UNDERESTIMATE THE POWER OF A MOMMY BLOGGER!!! I want to give a SUPER BIG THANKS to Sarah, One of the hosts for this Hop. She's one of those wonderful women that I have met throughout my blogger experience and she is such a great person. Super Sweet and Super Helpful! And remember if you want to be a co-host give Sarah an email. Jo from Jo, My Gosh! New lenses every day, and refreshing comfort all day long with every blink. Register for a Free Trial Certificate. I've decided to try for the BlogHer13 Bloggy Conference. I've never got the chance to attend a blogger conference before and I would be more than thrilled if I was able to attend one this year. I’m hoping that 2013 will be a big year for me. One of the things that I enjoy about my job as a blogger is that I am able to help out a lot of Small Businesses by helping them get their name out there and grow. Growing myself can do nothing but help the businesses that I work with. I would like your sponsorship to help support my effort in making sure this trip happens. BlogHer is a social media event presented by the Mommy Blogger Community. This year, the conference will be held in Sandusky, Ohio on September 13 - 15, 2013. I am currently looking for companies and brands that I can represent in the months leading up to the Bloggy Conference. I will be more than glad to send you a copy of my current Media kit. I have several sponsorship packages available. I am also willing to discus any other sponsorship ideas that you may have on mind. One blog post a month for 12 months - The posts will include your current deals, specials, products and anything else you would like me to add. Create a Pinterest Board dedicated to your brand ONLY - I will pin your promotions, products and giveaways along with my sponsored blog posts. I will share your board with my social followers atleast once a week for 6 months. Posts of your choice can be tweeted, posted on face book and pined during prime times for one year. I will Tweet, post on face book and Pin on Pinterest all my sponsored posts at prime times for one year. I will host giveaways of your choice of products through out the year at the times of your choice. One blog post per month for 6 months - The posts will include your current deals, specials, products and anything else you would like me to add. 3 months of Advertisement on my blog - your choice of Banner size and placement. One blog post per month for 3 months - The posts will include your current deals, specials, products and anything else you would like me to add. Create a Pinterest Board dedicated to your brand ONLY - I will pin your promotions, products and giveaways along with my sponsored posts. I will share your board with my social followers atleast once a week. Sponsoring/Providing a Laptop or iPad - Your Logo will be placed on the item and I will be using it through out the whole Bloggy Conference. 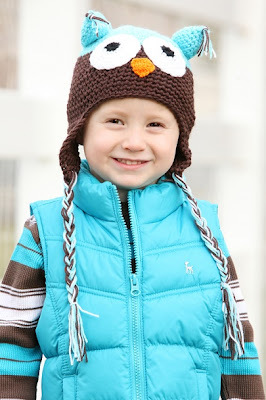 The Beautiful Story of Why My Dear Friend Joined Thirty-One! One of my close friends from High-school, Bethany Buckner Coy, has had a tough past couple years and has stayed strong through it all! She is an inspiration to me and I'm blessed to have such a wonderful friend in my life. After high school, I lost contact with most of my friends. I ran back into them little by little and we would hang out for a few months and then go back to not seeing each other often again but we always stay intouch. Year after year, I run into more and more of my high school friends and each time I get a warm feeling in my heart. When we all lost contact after school, we also lost phone numbers and all contact information. This was all before Facebook came along. I've found lots of old friends on facebook but seeing them in person makes you feel alot better. Ever since I ran back into Bethany, my life has been alittle bit brighter! We've only hung out a couple times in the past year but we've talked many times and I know she knows that I care. She sales Thirty-One and has a BEAUTIFUL story on how she came about being a Thirty-One Rep.
Knowing how special of a woman Bethany is, I wanted to share her story with you. She happily agreed and wrote up alittle bit of how she found Thirty-One! "I tell everybody that thirty one found me at a time when I needed it the most. I am a ten month employee (I work at a school) and I was looking for a part time job for the summer that would give me the extra money to do some fun stuff with my three year old daughter, stuff we normally wouldn't get to do. I went to a thirty one party about a year before and I fell in love with their products and prints. I knew I wanted to have a party but we just moved into a house and I wanted to get it "company ready" before I hosted a party. When the time came I was more than excited but the day before I was set to have my party I had a miscarriage. As heartbroken as I was and still am I decided to still have my party. My way of dealing was to act like it didn't happen. The day of my party I had a great turn out tons of family and friends came. I was over joyed by that I had to excuse myself at one point to go cry. My consultant, who is now my director, was so sweet and talked to me about her experience in losing a child. There, that night I told my husband I received a blessing. So we prayed about me joining thirty one. A week later we were at church and the pastor was talking about proverbs 31. (which is where thirty one got its name) I turned to my husband and said I guess this is what I needed to be doing. So the next day I signed up. The first 4 months were great! I was top in sales, I was meeting alot of great women and I was getting to spend the summer with my daughter making memories. Then again my world changed. I had 2 back to back surgeries, a month apart from each other, where in both... I almost died. Then I found out I had cancer. Here I was 27, only been married for 5 years, I had a 3 year old! So I had to stay true to my "why" my family! I put everything on hold and stop doing thirty one, to focus on them and my treatments. One thing that has given me great comfort is that if anything happened to me, my daughter had one great summer with me. It's been 6 months and I am finishing up with my treatments and I think I'm ready! Ready to start my life back and share my story in hopes it might be a blessing to someone else. I am excited to see what's in store." As you can tell from the story above, Bethany Buckner Coy is one special lady! I have been here with Bethany through her struggle with Cancer and I am so amazed at how well she has taken everything and how strong she has been able to be. Of course she has her bad days and the best are the good days, But everyone has those! 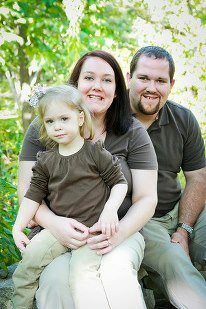 The support system that has been formed for Bethany Buckner Coy is more than anyone could of imagined! The Love is shown in many ways and it makes me smile to know that my dear friend is near the end of her battle and is going to be STRONGER THAN EVER! Cancer has always scared me, as my regular followers will know from my Daddy-Paw post, But Bethany has helped me so much just by staying strong and positive through her entire battle with Hodgkin's Lymphoma. She has inspired me to be stronger woman myself and to spend more time with my family because you never know when something can happen. I hope you enjoyed reading my friends story and I hope she inspires you to do something awesome with your life and to FOLLOW YOUR DREAMS! Thirty-One only ships to the US and Military APO/FPO addresses that are out of the US. I am willing to get things shipped to my house and ship them myself to you if you live in an area that Thirty-One will not ship to but YOU will need to pay all the shipping including the shipping it will take me to ship it to you. Bethany is in the process of making a Facebook Page for her Thirty-One Business and when she gets it get up I will link this post to it aswell as any other post I have up about Bethany or Thirty-One. But she will gladly answer any questions you may have for her. You can leave your questions under this post as a comment or you can find her personal page (Bethany Buckner Coy) on Facebook and send her a Direct Message. Know that if you send her a message on Facebook, it may be a few days before she responds due to it going to her Other Folder and not Alerting her of a new message. I was not paid in any way for this post, I wrote this on my own other than the story from my close friend, Bethany Buckner Coy. I did not write this for the reason of everyone buying Thirty-One from Bethany, I wanted to tell everybody about how I have an awesome friend who is such a strong woman. I want her to KNOW that she is Important and Special. If you would like to order from Bethany then that would be wonderful but that's not the whole point of this post. Mommy's Little Sunhine Warehouse SALE! This is one sale you DON'T want to miss out on!! Mommy's Little Sunshine is moving to a new warehouse so they have decided to have a HUGE Warehouse CLEARANCE Sale on their WHOLE inventory! Everything on their website has been marked down to just $5!!! You read right! JUST $5! Catch the Easter Bunny! REVIEW - FLASH GIVEAWAY! 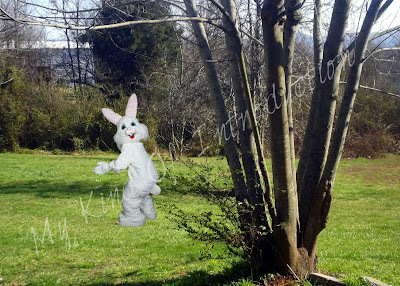 This Easter Season, I got the coolest opportunity to catch the Easter Bunny in my back yard for my little girls! 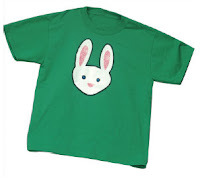 ICaughtTheEasterBunny.com is an awesome site that gives us parents the chance to put HUGE smiles on our kiddo's faces. You can catch Santa, The Easter Bunny and the Tooth-Fairy and Cupid! 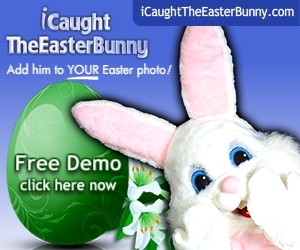 The Website is very simple to use, all you have to do is take a photo of the area you want The Easter Bunny (Since it's Easter time) to be caught. After you upload your photo, you get to chose which bunny pose you want to add to your photo. I couldn't make up my mind on which Bunny I wanted but after a LONG time looking at my screen I chose my Easter Bunny and placed him in my back yard!! You can chose the size of the bunny, I wanted mine to look like I was a good bit away from him and since I'm always running around taking photos of random stuff... My girls will LOVE this photo. They haven't seen it yet but I'm thinking I'll wait until Easter Morning before I show them. I can't wait until I can see the look on their faces! They will be so excited!! ENTER THE FLASH GIVEAWAY BELOW!! They will be 2 winners!! Bunny 'in the act'. Catch him here - Catch him there - Catch him ANYWHERE! Catch The Easter Bunny TODAY! ATTENTION BLOGGERS!!!! FREE BLOGGER OPP! Attention Bloggers - FREE Blogger Opp!! The Roaming Peddlers - Etsy Giveaway!! What's Emily Maynard been up to this year? Who will be 2013's NEW Bachelorette? The Belly Dance Digs - Etsy Giveaway! Attention Bloggers! FREE BLOGGER OPP!! The Kids' App Pack Giveaway!